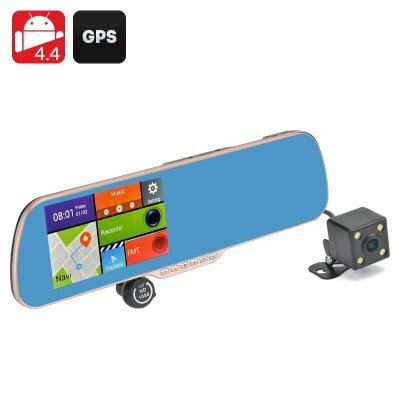 Successfully Added Android 4.4 DVR + Parking Camera "Gold Vision II"- 5 Inch Touch Screen Display, GPS Navigation, 720P Resolution to your Shopping Cart. The ‘Gold Vision II’ backup mirror with DVR and parking camera is the smart way to make driving easy. Free yourself from the stress of busy streets and remove all concerns of false claims, getting lost and parking hassle as the Gold Vision II protects you from all. With its 5 Inch touch screen and user friendly Android 4.4 OS this rear view mirror brings GPS technology to keep you on the right path to your destination. Now you can enjoy Android in your car as well as on your phone and with its HD front facing camera you will have a full view of all that lays ahead. What better way to protect yourself against fraudulent insurance claims and any road disputes than with 720p high resolution images. This car camera kit also includes a reverse parking camera that will bring you confidence when reversing and help you detect any hidden obstacles that aren't visible in your mirrors. it will also let you ease in and out of thos tight parking spots without any assistance so you can be a master of the roads. Driving can be hard enough without having to keep an eye out for directions and remember every turn you need to make, especially in big cities where its easy to take a wrong turn and get lost turning an otherwise plesent journy into a headache. well dont worry! with the GPS on this Android 4.4 rearview mirror camera kit you can be guided turn by turn to your location so all you need to do is sit back and enjoy the ride, it really couldnt be easier. The Gold Vision II backup mirror and DVR comes with a 12 months warranty, brought to you by the leader in electronic devices as well as wholesale rearview car cameras..